GPMCT worked with Lucerne-in-Maine Village in spring 2005 to place permanent conservation easements on village-owned properties on and near Phillips Lake – at the headwaters of the Orland River and Union River Watersheds. 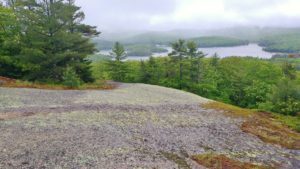 These easements protect Sunset Ledge, six islands in Phillips Lake and a wooded 10-acre strip of land behind Camp Capella. The Sunset Ledge parcel protects about 17 acres of forested upland and open ledge at 840 ft. with spectacular views of Phillips Lake, Mud Pond and Second Pond. An easy trail leads from a parking lot at the end of Sunset Road.